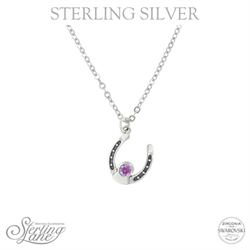 Sterling Lane Personally Mine Horseshoe Necklace, February This sterling silver horseshoe pendant offers a wonderful opportunity to have a treasure for a lifetime, just for her. 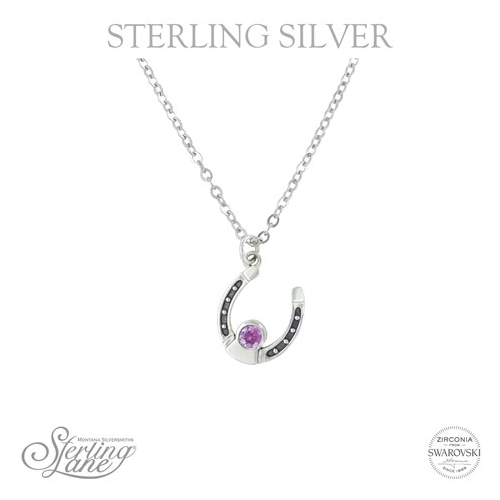 The classically shaped horseshoe design has a light antiquing around the bright dots of sterling silver on the side, signifying where the nails would go on a real horseshoe. A round Swarovski® Zirconia rests at the base of the horseshoe and can be personalized with one of 12 birthstone colors. The pendant dangles from one end on a princess length 19 inch chain. Dimensions: Width: 0.48" Height: 0.57" Length: 19" Materials : Rhodium plated sterling silver. Swarovski Zirconia. Rhodium plated sterling silver chain. Care & Storage Message : Clean with warm water with a mild soap. Over time, rhodium plating may wear off and the sterling silver will oxidize into a patina. DO NOT use chemical or abrasive cleaners. Do not resize.